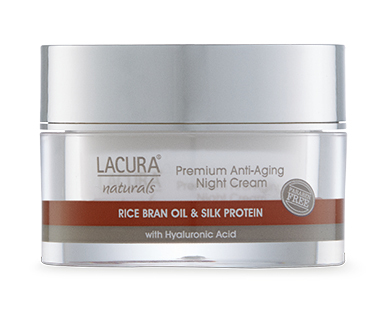 The LACURA® Naturals Anti-Aging Night Cream is a rich lightly scented formulation to helps restore essential moisture while you sleep. Contains a blend of rice bran sweet almond and soya oil to provide deep hydration. Contains hyaluronic acid to help plump the skin, increase skin elasticity and help minimise the appearance of time lines and wrinkles. Range includes: Day Cream 50ml, Night Cream 50ml, Serum 30ml or Eye Cream 15ml.